Yes, It Snowed. We Know Because of Patio Furniture. – Entertainment Ave! Yes, It Snowed. We Know Because of Patio Furniture. I’m guilty. I admit it. I post pictures of things covered with a lot of snow. It seems, however, that I’m not alone. Yes, one thing that has always been a given, probably since the dawn of the cave drawing, is that when it snows we feel the need to convey the amount of snow by taking pictures of outdoor things with snow on them. The cave drawings may have had pictures of maybe a wheel, or a round rock, with snow on it, there is probably some painting with a castle with a foot of snow on the top of it, and I know even when I was a youngin’, with one of those cameras that used that film stuff, when it snowed I would be out the door taking pictures. Now of course, with the camera phone, the pictures are everywhere. Pictures of the outdoor grill (like mine) with snow on it, pictures of patio furniture with snow on it, pictures of cars with snow on them, and pictures of people playing in the snow. For whatever reason, whatever the need, we have to show the world, even our neighbors right next door who can see our patio, how much snow we have. There was a viral video of a news anchor who was sick of the patio furniture covered with snow, but I have a feeling the dude is fighting a losing battle because it has happened, happens today, and whatever technology happens in the future, when it snows I’m sure we will tell everyone. 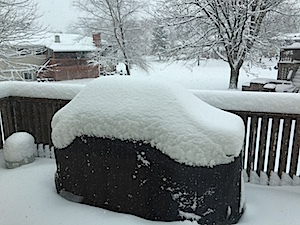 I’m guessing this is a 100%er in the world of polls for those who live where it snows, but let’s do it: Have you taken a picture of patio furniture covered with snow?